The luxury charter yacht SEVEN SINS is running a fantastic deal between 22nd August and 2nd September, where she is available for a 9-day yacht charter for a price of 7. 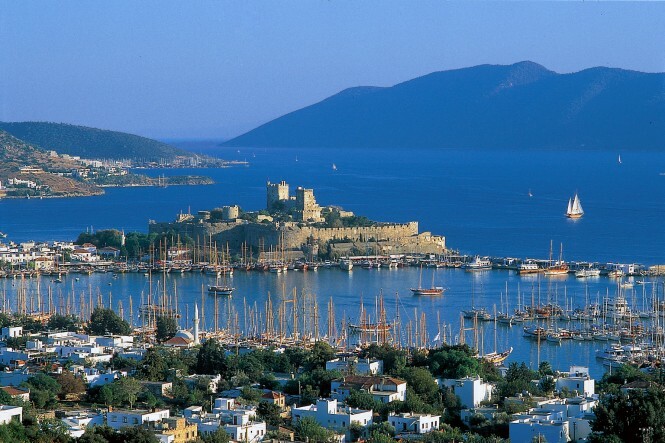 The offers is valid for Eastern Mediterranean superyacht charters, accommodating up to ten charter guests. SEVEN SINS yacht is an outstanding and popular charter boat, built by the prestigious Heesen shipyard in 2005, which has received numerous refits since then. 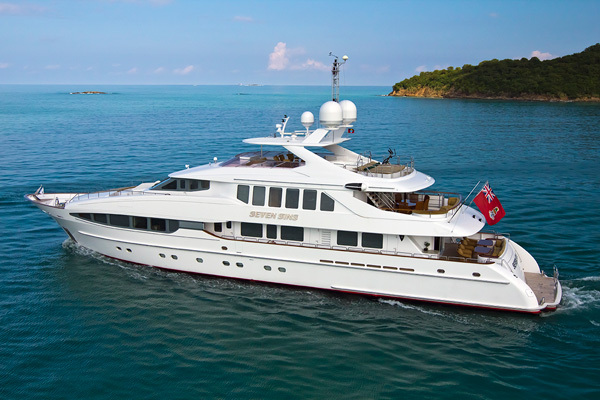 In 2014/2015 she underwent a major extension refit and now features additional deck space, one more crew member, renovated interiors and additional yacht toys for guests’ entertainment. 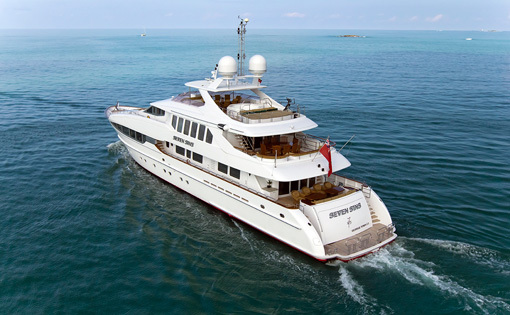 Omega Architects were responsible for motor yacht SEVEN SINS’ exterior styling, which features lovely semi-gloss cherry wood panelling. The interior boasts teak and ebony flooring, combined with beautiful Makassar furniture. There is a fully-equipped professional galley on board for your personal 3 Michelin star Chef to create mouth watering dishes according to your desires and taste. Exterior decks are equipped with settees and tables, as well as sunbathing areas. The spacious main saloon was fitted with a bar and a relaxing area with a 50 inch plasma TV. The formal dining room seats all of her charter guests in an elegant setting around a lovely oval table. SEVEN SINS boasts ten large side windows in the main saloon allowing for plenty of natural light and fantastic views of her surroundings. The upper deck saloon was styled with an Asian ambience and can be used as a theatre area with a 60” plasma screen TV. The upper deck offers a possibility to enjoy al fresco dining with a table, seating up to 12 guests. Her sun deck has another table for 10 as well as a spa pool and sun mattresses. 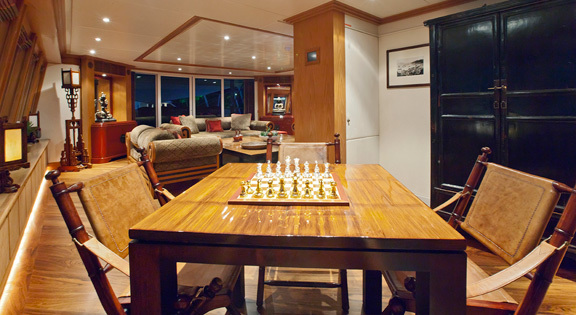 Accommodation is spread over five staterooms, including a full-width mains-deck master suite. The master stateroom features a study with an internet connection, a walk-in dressing room, a deluxe bathroom with a spa pool and a separate large marble shower with ‘his & hers’ toilets. The two VIP full-beam cabins and two further guest cabins with twin beds feature en suite marble bathroom facilities with showers and other luxurious amenities and accessories. Guests are services by a professional crew of eight members. There is a vast selection of water toys and equipment for unlimited in-water fun and entertainment. 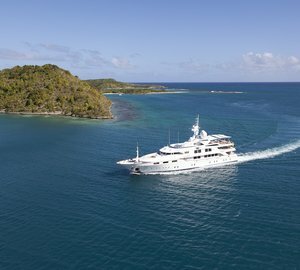 Luxury charter yacht SEVEN SINS is available for Eastern Mediterranean yacht charter as well as Italy charters. She is available in Turkey, Greece, Croatia as well as Montenegro. Your made-to-measure itinerary could include other smaller islands and destinations of your choice. SEVEN SINS can usually be chartered for a high season rate of EUR€137,500 p/w + exp, and a low season rate of EUR€125,000.00 p/w+exp. Please, contact us for more information and gratuitous assistance. Please contact CharterWorld - the luxury yacht charter specialist - for more on superyacht news item "'Two Days Free' for East Med Yacht Charter aboard 43m SEVEN SINS Superyacht".